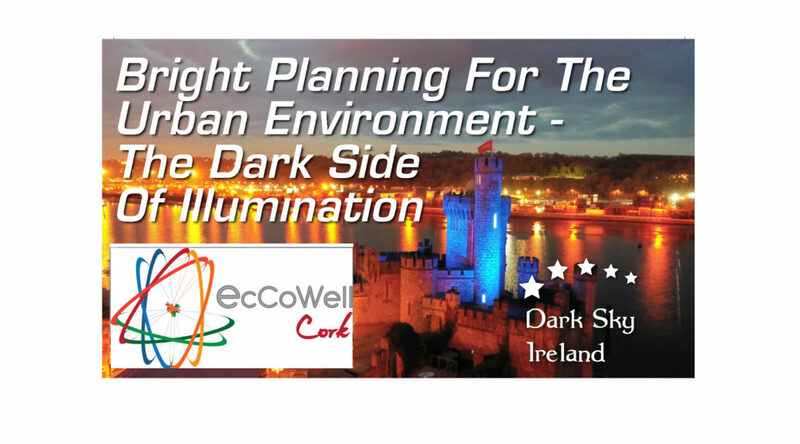 Light Pollution is a growing concern in Ireland, with direct implications for the economy, security and the environment, and with potentially significant impacts to human health. There is currently no national policy or legislation in Ireland to deal with light pollution. In light of recent announcements that high-efficiency-lighting retrofits are due to be rolled out on a national level, it is crucial that Ireland adopts a lighting policy that is evidence-based and reflects the very best practices in terms of protecting our health, our economy, our environment, and indeed our Dark Sky Heritage. Join the conversation at our EcCoWell event. This event is relevant to all stakeholders in the community, from architects, policy makers, and special interest groups, to the concerned and informed citizen. The provisional agenda for the EcCoWell event is available here.